Here you can read some of the feedback that we have received from some of the viewers of our site. Thank you for sending feedback, that is what really makes this site so nice, and exciting! Please feel free to send us any ideas on how to make our site more user friendly by using our Contact Us button on the Main Page. Hello! First of all, I just want to compliment the Committee on it’s very beautiful website. I’ve included a link to it at my own Kateri site. Second, would it be possible for me to get on the Committee’s mailing list and receive your newsletter? 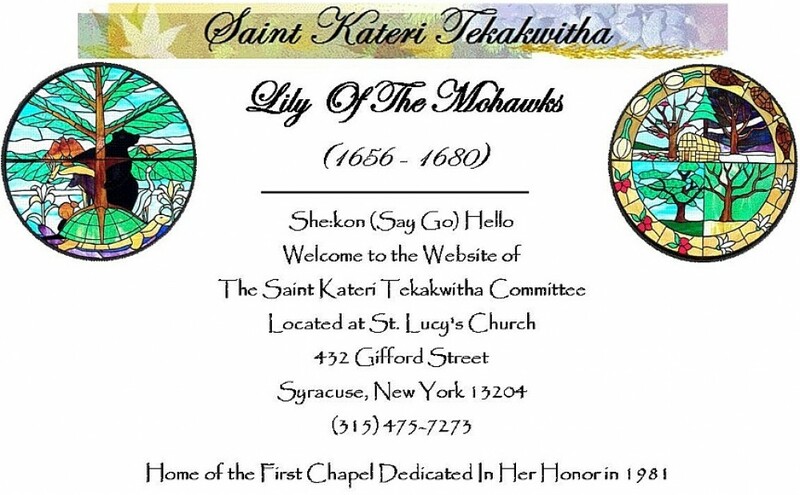 I live just a bit too far away from Syracuse to participate actively, but I’d like to keep up with your Kateri happenings and list them on the Events page of my site. Based on the pictures at the site, your Kateri Chapel looks beautiful. I hope to visit it if I am in the area. Recently, my sister asked about my Bl. Kateri statue and asked where she might obtain one. She and her family have been going through some difficult trials. I feel that somehow Bl. Kateri’s intercession will help her and her family, especially her husband who has had a 2 heart attacks and now suffers from diabetes. Please add my name to your newsletter mailing list. I am praying for a miracle through Blessed Kateri Tekakwitha Leah Clare Tharp De Batty Charlotte, N. C.